If you’ve ever dropped your cell phone in a pool of water, you’ve probably wondered exactly how waterproof your phone is. Likewise, if you’ve touched or splashed water onto an electrical outlet or lighting fixture in your bathroom, you may have worried about how dangerous that could be. This is exactly why IP ratings were created. International or Ingress Protection (IP) ratings are international markings developed by the International Electrotechnical Commission to identify the degree of protection provided against solid foreign objects, such as fingers and dust, and liquid infiltration. The ratings consist of two digits — one which applies to solid particles and the other which applies to liquid ingress. If no data is available to specify a protection rating, the letter “X” is used. If no protection is offered, the number “0” is used. tolerate "solid particles," such as fingers. The first digit in an IP rating refers to the electrical device’s protection against solid particles. Solid particle protection can be rated anywhere from 0 to 6. A rating of 1 means the device is protected against any accidental touch from a body part greater than 50 mm in size, such as the back of the hand. It is not protected from deliberate body contact, though. A rating of 2 means that fingers or similar objects greater than 12.5 mm are safe when coming into contact with the device. A rating of 3 means the device is protected from tools and thick wires greater than 2.5 mm in size. A rating of 4 means it’s protected against most wires and narrow screws greater than 1 mm in size. A rating of 5 means the device is “dust protected,” which means dust is not entirely prevented from entering the device, but it must enter in a large enough quantity to interfere with the operation of the device. Finally, a rating of 6 means the device is “dust tight.” This means the device is completely protected from dust infiltration. The second digit in an IP rating refers to the electrical device’s protection against liquid ingress. Liquid ingress protection is rated from 0 to 8 (excluding road vehicle ratings). A rating of 1 means the device can withstand 10 minutes of dripping water equivalent to 1 mm of rainfall per minute when mounted in an upright position and rotated at 1 rotation per minute. A rating of 2 means the device can tolerate 10 minutes of dripping water equivalent to 3 mm of rainfall per minute when tilted at a 15-degree angle and rotating. A rating of 3 means the device is protected against spraying water from an oscillating fixture or spray nozzle with a counterbalanced shield at an angle up to 60 degrees. A rating of 4 means the device can tolerate splashing water from any direction with an oscillating fixture or spray nozzle with no shield. A rating of 5 means the device can withstand water coming from a nozzle at any direction. A rating of 6 means that powerful water jets will not cause any harmful effects when coming into contact with the device from any direction. A rating of 7 means the device can be immersed in up to 1 m of water for 30 minutes without any damage. Finally, a rating of 8 is similar to a 7 rating, but the depth of the water and duration of time is to be specified by the manufacturer. Generally, the depth should be up to 3 m, and the duration should be longer than 30 minutes. which means they are protected against splashing water. Beyond these numerical ratings, additional letters can be used to provide further information about the device. For instance, the letter “f” means it is oil resistant; “H” means it is a high-voltage device; “M” means the device was moving during a water test; “S” means the device was standing still during a water test; and “W” refers to weather conditions. For example, if an electrical socket is rated IP22, that means it is protected against the insertion of fingers and remains safe when exposed to vertically or nearly vertically dripping water. This rating is the typical minimal requirement for indoor electrical accessories. Another example is WarmlyYours Radiant Heating’s new Marquee LED mirrors, which feature an IP rating of IP44. This means they are protected against the infiltration of most wires, slender screws, etc., that are greater than 1 mm in size. They are also protected against water splashing against the fixture from any direction, which is vital for bathroom lighting fixtures. This rating qualifies the mirrors for use in specific bathroom zones that are subject to some contact with water — zones 2 and 3, to be specific. When referring to electrical fixtures in the bathroom, it’s important to consider where the fixture is located to ensure that the fixture you install has the proper protections in place. 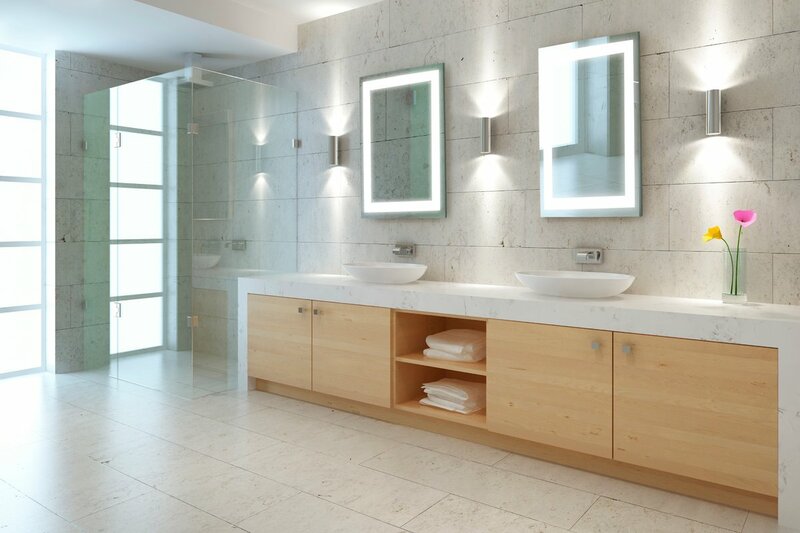 When it comes to bathroom lighting, there are three possible zones. Zone 1 is located inside the bath or shower. Any light fixture installed in this zone must be low voltage with an IP rating of at least IP67. An IP67 rating will ensure that the fixture is protected against water immersion. 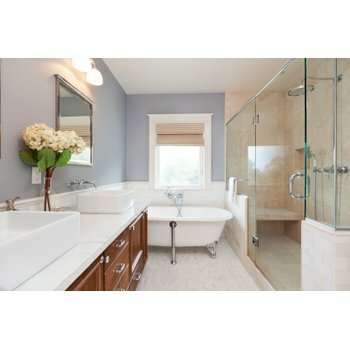 Zone 2 is the area above the bath or shower, up to 7 feet 4 inches from the floor. A minimum rating of IP45 is required in this zone; however, an IP67 rating is typically suggested. Zone 2 is also located nearly 2 feet from the perimeter of the bath or shower and 7 feet 4 inches high. A minimum rating of IP44 is required in this zone. Beyond Zone 2 is Zone 3, where no water is likely to be found. Thus, there are no IP rating requirements in these areas. However, because it is still located in the bathroom, it’s recommended that electrical fixtures with a rating of at least IP20 be used. 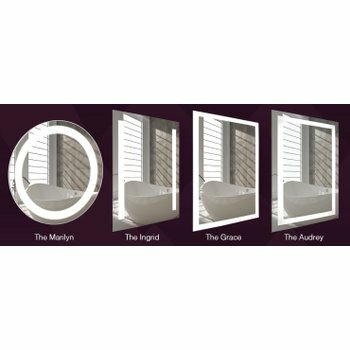 For more information about WarmlyYours’s Marquee LED mirrors, click here.